You wouldn’t normally expect to find trendy, liquid nitrogen-molecular gastronomy cooking going on inside an 1881-era Victorian mansion. 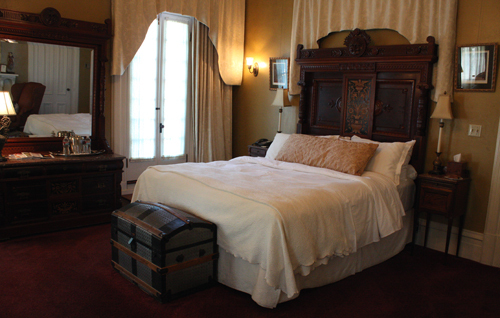 But at Madrona Manor in Healdsburg, that’s just what you’ll enjoy at the acclaimed Michelin one-star restaurant on the premises of this 22-room historic inn nestled in the hills above the Dry Creek Valley in Sonoma County. 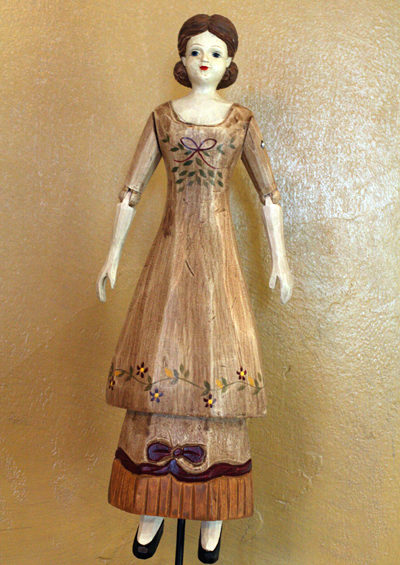 Recently, I was invited to be a guest of the inn, which is charmingly decorated with period antiques and art pieces, including hand-painted wooden dolls and a framed Victorian lace wedding gown. 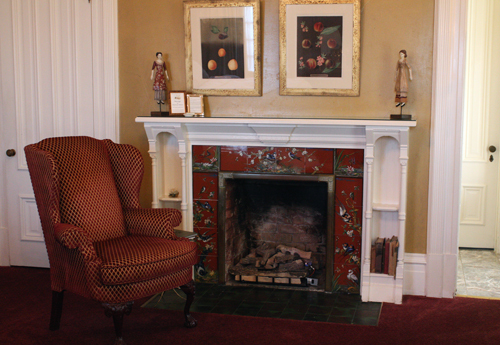 The rooms feature fireplaces and claw-foot tubs. Homemade chocolate chip cookies are left by the bedside to welcome you. Executive Chef Jesse Mallgren has cooked alongside some of the biggest names in the industry, including Jeremiah Tower and Gary Danko. He draws inspiration from local ingredients, including the 3/4-acre organic garden on the premises, where he harvests tomatoes, herbs, greens and fruit that show up in many dishes on the menu. The restaurant can seat 90 inside its five intimate, candle-lit dining rooms. 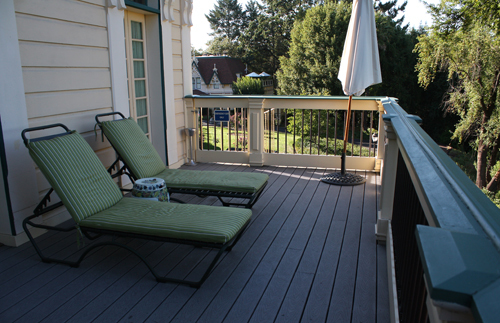 But on a warm summer night, there’s no better place to be than the spacious, 45-seat veranda. The sides have shades that can be lowered or raised so that you’re never blinded by the sun. There are heat lamps in case it turns cool in the later hours of the evening. And a long, narrow window on the side of the building lets you peek into the activity inside the kitchen. The veranda overlooks the inn’s eight acres of lush gardens. 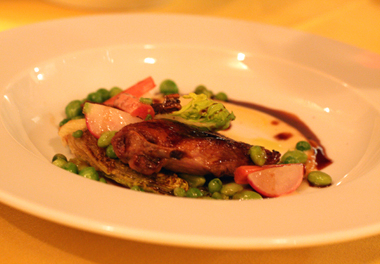 As you sit back with a glass of bubbly, you almost feel like you’re dining in the South. It’s all so genteel that you can almost imagine a game of croquet happening on the lawn behind you. You feel like you’re stepping back in time — until the first dish arrives and you realize the meal you’re about to experience is all about modernist cooking. Rather than a jarring juxtaposition, it makes for an unexpected but appreciated surprise. 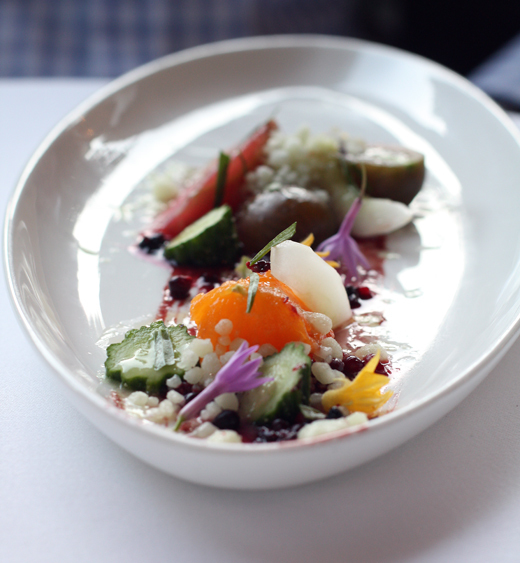 A five-course tasting menu is $85; wine pairings are an additional $58. You can add additional courses, too, for $15 each. 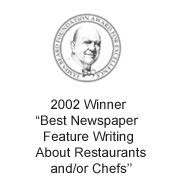 With this option, you choose your courses from the categories of “Clean/Crisp,” “Soft/Delicate,” “Smooth,” “Meaty,” “Fromages” and ‘Sweet.” In memoriam, Mallgren has one space on the menu designated as: “Previously occupied by a foie gras dish. 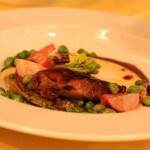 Banned 7/12.” It’s a nod to California’s new law that makes the selling or producing of foie gras a crime. 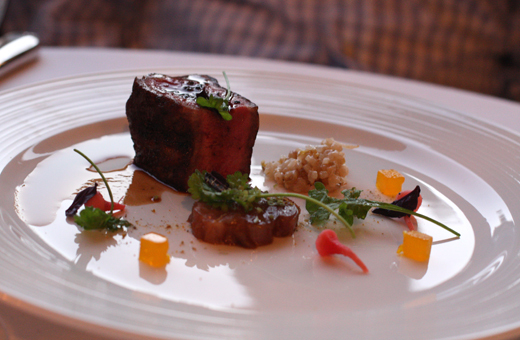 The other option is the chef’s tasting menu at $119 per person with an additional $81 for wine pairings. There are nine courses and the only clues you get to what they will be is a cryptic list of ingredients noted on the menu. In order to try as many different dishes as we could, my husband and I opted for the five-course menu, with each of us ordering different things. 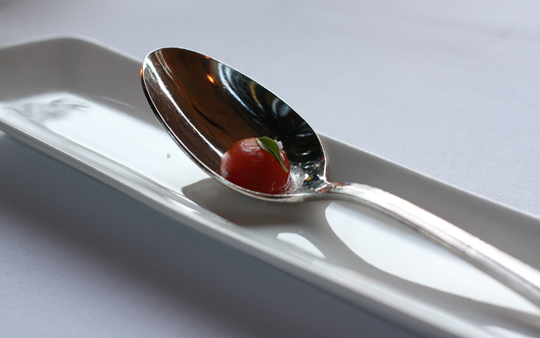 But first a series of amuse bouches to tantalize. A tiny radish from the garden served with an equally teeny Parmesan crisp. 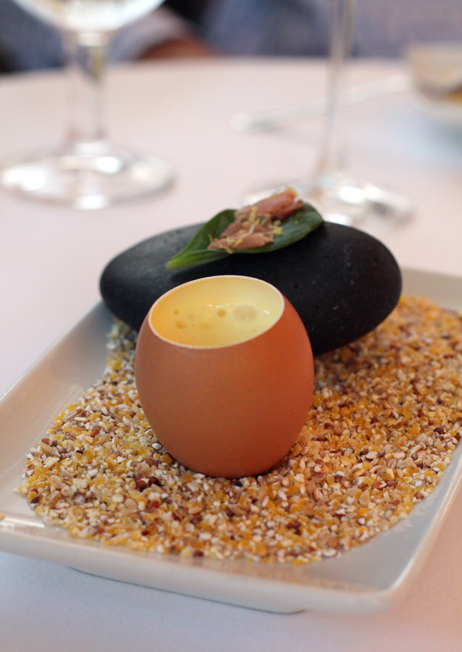 Next, a classic soft egg cooked inside its own shell, the top of which is cut off so you can easily get a spoon inside. Dig deep, as you’ll want to get a taste of everything inside — from the smoked sabayon to the sherry vinegar. Beside it on a smooth river stone is a small green leaf with prosciutto on top. Take a bite and be amazed at how the leaf tastes exactly like an oyster. It’s from a plant actually called oyster leaf. Another gift from the garden is set down — a doll-size cherry tomato, impossibly peeled to reveal its flesh in all its sweetness. 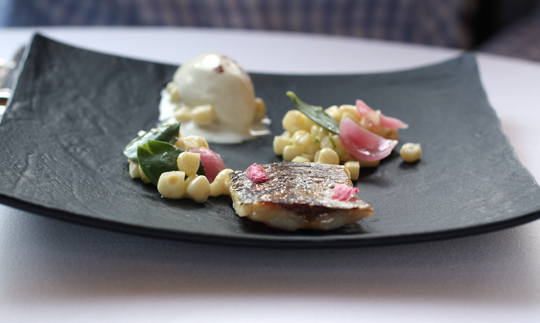 Mackerel gets a wonderful smoky treatment, its tender flesh accompanied by miso ice cream that is fairly subtle. 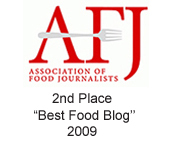 In fact, I wisdhe it had a more full-on, salty-fermented flavor. Sea bream is served crudo-style, with raw slices drizzled with extra virgin olive oil, a grating of fresh wasabi and edible coral-colored bean flowers. 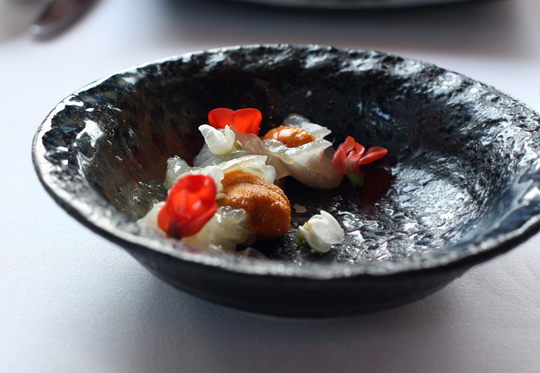 Tongues of Mendocino uni were the crowning touch in a dish that was bright, clean and silky on the palate. Everyday tomatoes and cucumbers are reborn here with ones grown on the estate. I can’t remember the last time I had cucumbers with so much flavor. Little frozen pearls of cucumber ice add even more cuke -ness. And a drizzle of thick blackberry balsamic adds acid and round fruitiness. 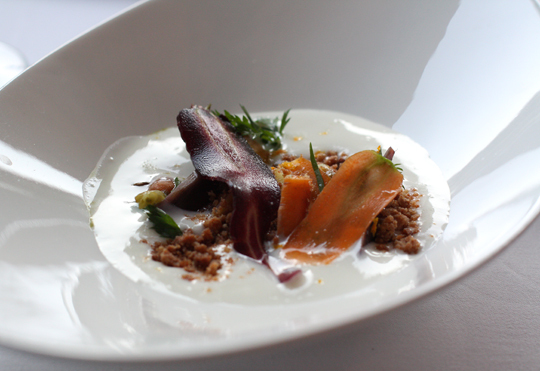 Long shavings of heirloom purple and orange carrots frame the next dish, which sit in a pool of rich, creamy fromage blanc-Green Goddess dressing. 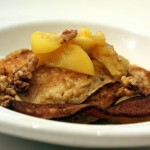 A crunchy crumble of rye on top adds texture and earthiness. Scallops are live and shucked to order here in a dish with carrot foam and chanterelles. 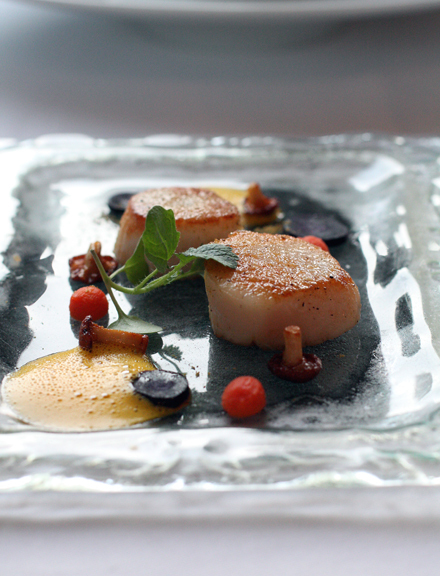 The scallops get dusted with chamomile for a lovely floral note. 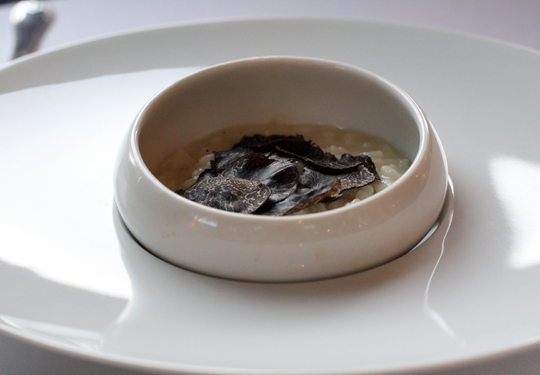 Australian black truffles get shaved over risotto with melted leeks. It’s as luxurious tasting as it sounds. 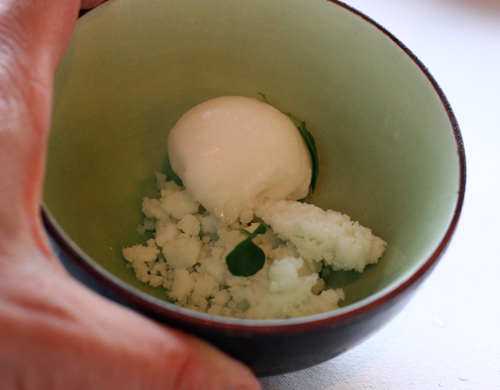 A palate cleanser is presented: A scoop of lemon sorbet with icy crumbles of wild mint granita. It’s as refreshing as toothpaste in the morning, but tastes far, far better. Grilled 28-day dry aged beef gets a Vietnamese twist for a great change of pace. 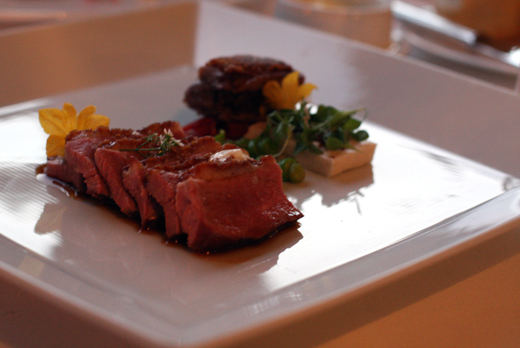 There’s the lilt of star anise to the tender meat, which also comes with a pressed slab of chewy tendon alongside. Mung beans are diced to resemble risotto. Pickled daikon dots the plate, along with clever golden gelee cubes of egg yolk. Eaten together, you almost think you’re enjoying a bowl of pho — but in a whole different way. The same is true with duck here. Slices are fanned on the plate with caramelized onions and buttermilk custard. You taste cumin and realize it’s a play on falafel. How wonderful is that? Oh, but the fun has only begun. First, an intermezzo of “milk and cookies” to get you ready for the change in courses. 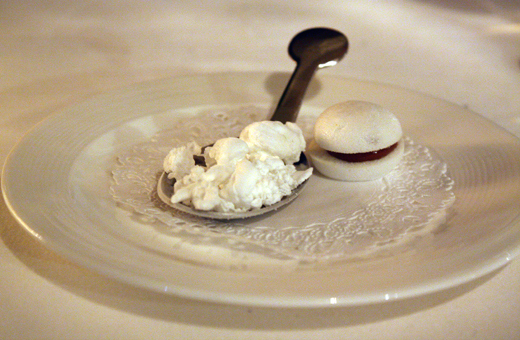 It’s frozen cream on a silver spoon alongside a macaron. 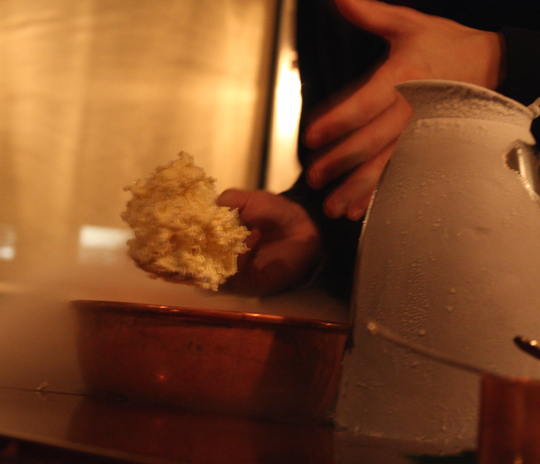 Just be careful with the spoon, which is so cold from the liquid nitrogen that it can almost stick to your tongue. 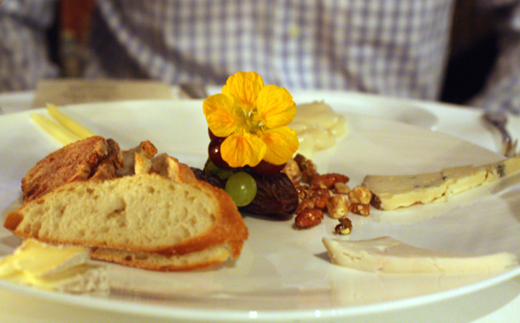 A cheese course is an additional $10. But it’s large enough to share, which is what we did. After the cheese cart is rolled to your table, the server sets about cutting small portions from each of the six cheeses offered and arranging them on the edge of a large plate. The cheeses are from around the world — from Rogue Creamery’s Caveman Blue raw cow’s milk cheese that’s made in Oregon to the Bo Peep cow’s and sheep’s milk cheese from Bohemian Creamery in Sebastopol to the Nevat goat’s milk cheese from Can Pujol of Barcelona, Spain. For dessert, I went with the “Tribute to New Orleans,” served on an artsy plate that resembled a wrinkled piece of white fabric. 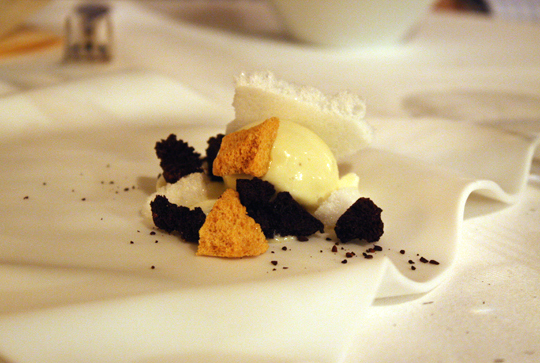 It’s a taste of coffee and chicory with ice cream, dehydrated milk foam, puffed toffee and creme fraiche. My husband went with what is inevitably the most popular dessert item on the menu: “Cart a Glace.” It’s an ice cream sundae. But it’s made in front of you. The ice cream, too. The server rolls another cart over to the table, as all eyes can’t help but turn to look. 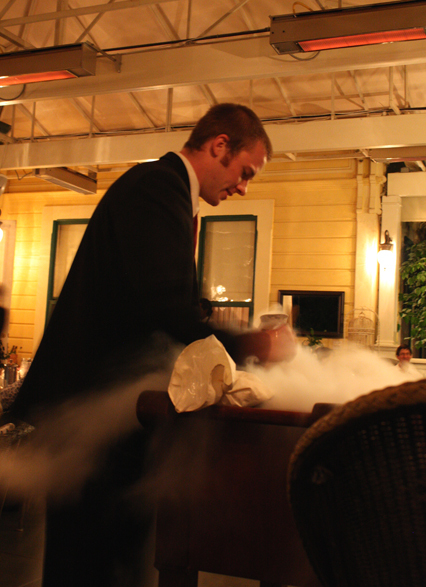 He pours the ice cream base into a bowl, then adds the minus 320-degree liquid nitrogen as its dry ice-like cloud of smoke rises like out of something out of a mad scientist’s laboratory. Sure, it’s a show. But there’s a reason why so many pastry chefs love making ice cream this way rather than the old-fashioned way in which it’s churned in a machine. 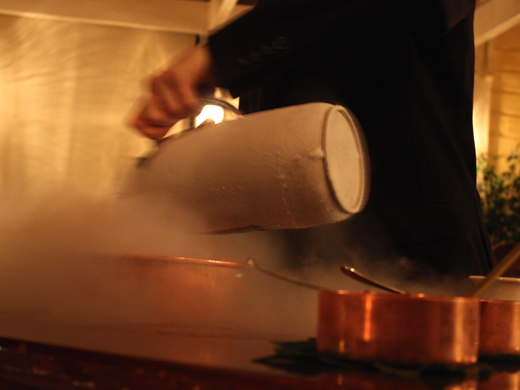 With liquid nitrogen, you get a smoother consistency. There are never any pesky ice crystals to contend with. 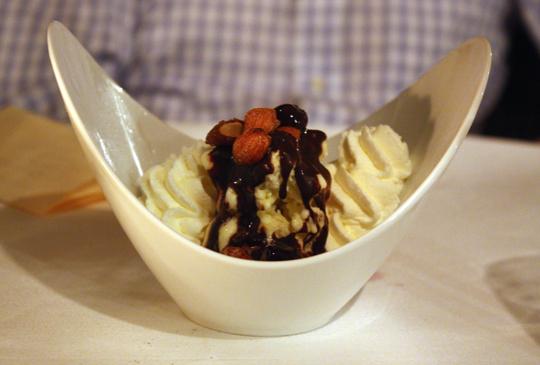 The ice cream is scooped into a serving bowl along with chocolate sauce, almonds, fluffs of whipped cream, and of course, a few brandied cherries. No matter what your age, you just gotta love it. 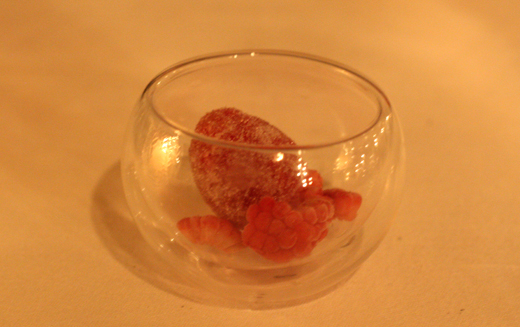 You might think you’re done, but then a tiny cup arrives, holding raspberry gelee with “shattered raspberries,” fresh ones that have been hit with the liquid nitrogen again to freeze them so they do almost shatter on contact. 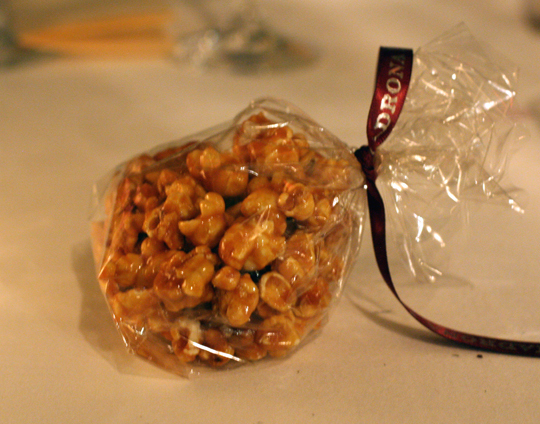 And lest there’s any chance you might need a snack later, you’re presented with small bags of house-made caramel corn to take with you. 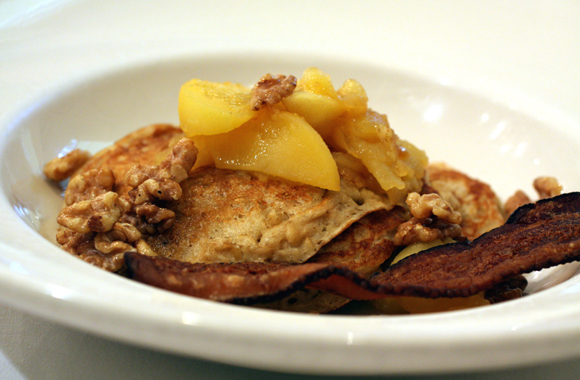 If you’re staying at the inn, a buffet breakfast is included the next morning. 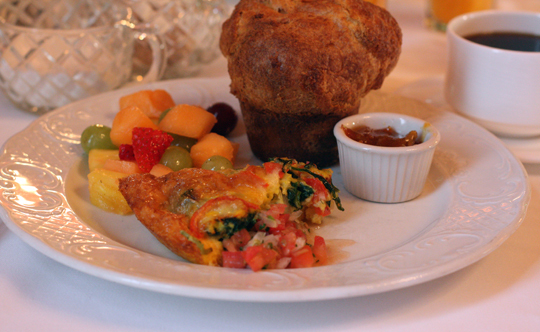 Help yourself to a frittata brimming with veggies, fresh fruit, cheeses, sliced meats and puffy popovers. 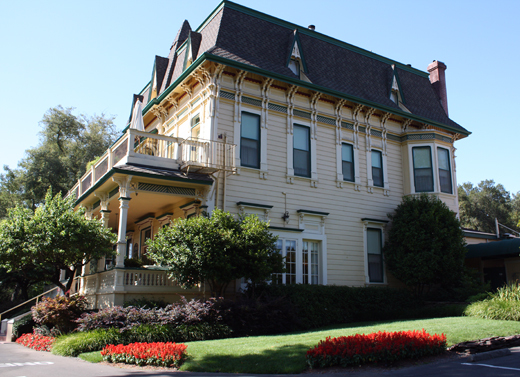 It’s hard to say good-bye to Madrona Manor. But there’s no doubt when the time comes, you will do so with a full and happy stomach. What an amazing place to relax, have some good time and eat well! What a great get away place! The food dishe slook just superb, Perfect dining & wining & a beautiful scenery ! Wow! Lucky you! What a spectacular meal!! And the inn is lovely. I love a quaint in as such. So peaceful and the food looks amazingly yum! Wow these dishes look incredible. 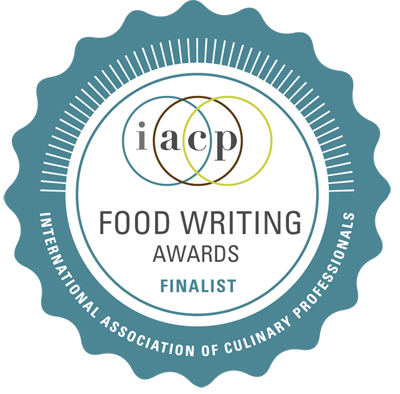 I’ve read so much on molecular gastronomy, watched videos and would love to take a class to view the magic in action. What a fun trip this must have been and restful!